Add salt, pepper, a small amount (1/2 tsp?) baking powder, ONE of the eggs, and the flour. Stir into a batter. Pour a small amount of oil or butter into the pan (I used canola to coat the pan and a pat of butter for flavor). Add zucchini pancake batter. Cook on medium-high. Edges will start to brown. Eventually, once it’s solid enough that you can run your spatula under the edges, flip one end of the pancake onto the other — like folding an omelet. In the empty space, add another pat of butter and crack in your second egg. Let both cook on medium heat until done. Pop ’em onto a plate, add ketchup or whatever…and eat! 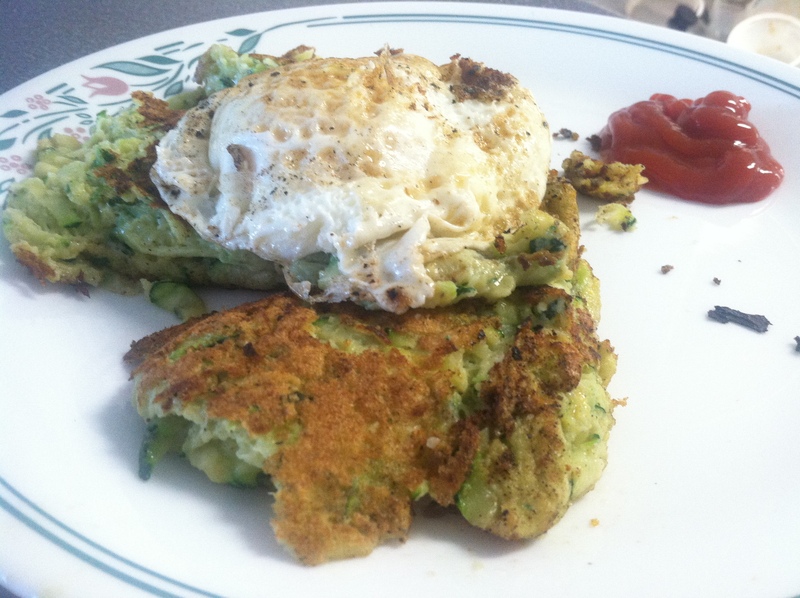 Posted on July 28, 2013 September 24, 2013 by Olivia FecteauPosted in foodTagged breakfast, breakfast for dinner, dinner, eggs, gluten-free, pancake, recipe, yummy, zucchini.